Not ready to go for a full edition? Our Basic edition is designed to bring you the most essential features of the ScreenTag platform. Consider it to be a paid unlimited trial that you can use for as long as you like, just to test how ScreenTag works. You can either use it as is, or upgrade whenever you like to one of our full-featured editions. 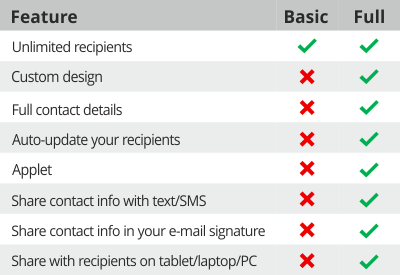 With Basic edition you can share with your recipients your name, e-mail and cell phone number. Basic works on Android, iOS and Windows phones. Upon successful payment you will be redirected (or receive instructions in your e-mail) to the contact details submission page. In the rare case that you are not automatically redirected or notified, our customer service team will be contacting you to offer guidance about how to submit your contact details, or you may notify our customer service team here. By submitting an order, you are entering into a service agreement under certain terms and conditions. Orders paid using a credit card are processed by our global reseller, FastSpring, and subject to Sales Tax (where applicable).